Over the past several years, the Legislature and Governor Cuomo have taken some very positive steps to reform the tax code and lighten New York’s tax burden—including the cap on local property tax levies, enacted in 2011; the reform of corporate and estate taxes, enacted in 2014; and, most recently, a multi-year reduction in state personal income taxes on middle- to upper-middle-income households, enacted in 2016. Unfortunately, the most notable tax and revenue proposals in the fiscal 2018 Executive Budget would move New York in the wrong direction. For example, the budget includes a three-year extension of what amounts to the state’s third largest tax—the $5.7 billion in dedicated revenues collected through the state Health Care Reform Act. 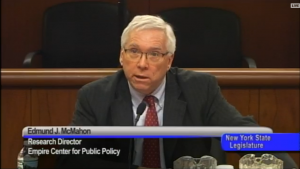 Bill Hammond, Empire Center’s health policy director, recently issued a report documenting the counterproductive and inequitable impacts of the costly HCRA program. While HCRA is not, strictly speaking, a focus of this hearing, the program’s purpose and cost deserves a closer look than it appears to be getting. Another problematic feature of the budget is a proposed extension of the Film and TV Production Credit, now scheduled to expire after 2019. Since the program’s inception in 2004, the state has awarded or allocated roughly $4.5 billion in film and TV production credits—far beyond any program of this type in the country. There is mounting evidence that such programs don’t work and don’t pay for themselves. I would submit that it’s time to bring down the curtain for good on this gratuitous giveaway. I would like to devote most of my testimony this morning to the Executive Budget revenue proposal that has garnered the most attention: a three-year extension of the state surtax on million-dollar incomes. As you know, the so-called millionaire tax rate of 8.82 percent is scheduled to sunset on Dec. 31, returning the top rate to its permanent law level of 6.85 percent. Under the middle-class tax cut tax schedule you enacted last year, the 6.85 percent rate ultimately will apply only to incomes above $321,000. There are several reasons this proposal does not deserve the Legislature’s full support. First, assuming you continue to join Governor Cuomo in restraining spending growth to 2 percent a year, it appears you won’t need the money. Based on the Executive Budget financial plan, you can reduce the tax to below 8 percent in 2019, and can eliminate it entirely before the end of 2020. Table 1 in the appendix breaks down these numbers. Second, the millionaire tax is anti-competitive—out of line with tax rates in most of the country. 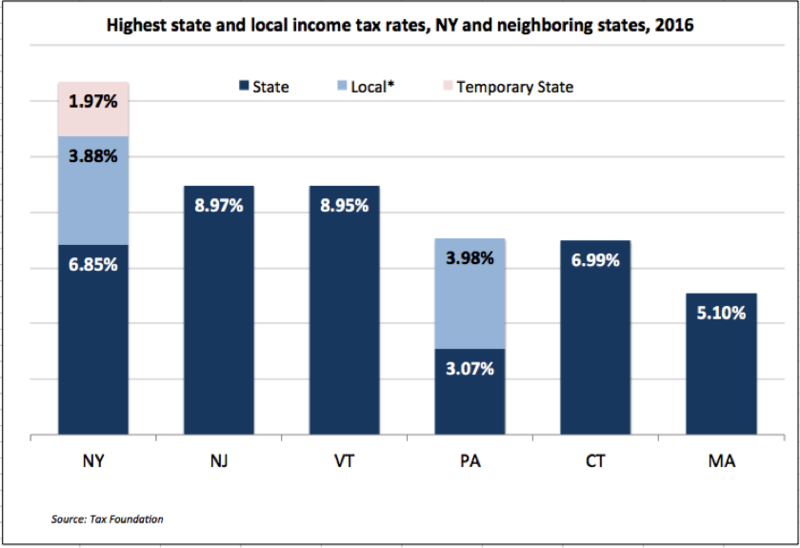 Figures 1 and 2 in the appendix illustrate the top combined state and local rates for all states, and Figure 2 focuses on the rates in New York’s neighboring states. 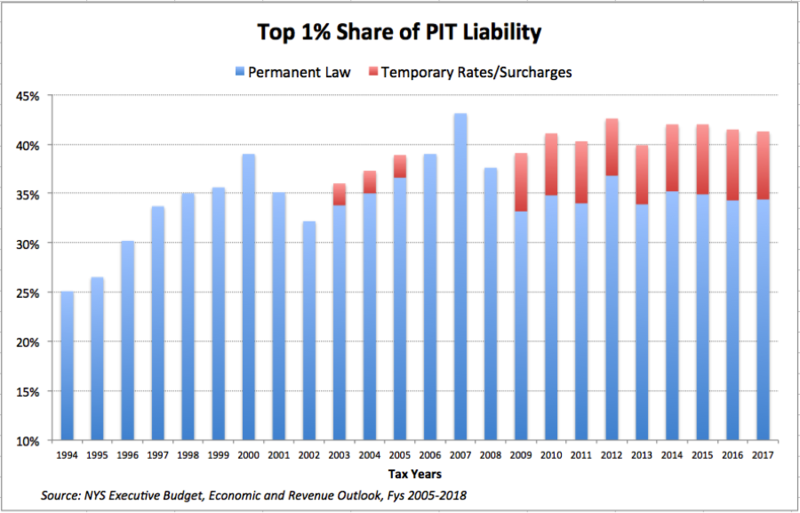 The current rate of 8.82 percent is a hair below the previous temporary rate enacted in 2009, but it is higher than any permanent PIT rate imposed by New York since the historic, bipartisan state income tax reform enacted by the Legislature in 1987. 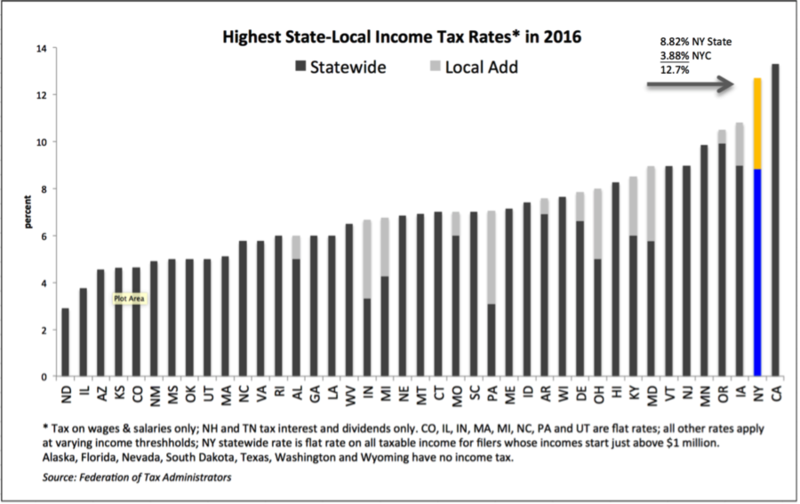 It ranks 7th among all statewide income tax rates as of 2016, and second highest among the 10 largest states that have an income tax. Among the 43 states imposing any individual income tax, the median top rate was 6 percent last year. The personal income tax isn’t just ”personal”: it’s also an integral part of the business tax climate, because a significant number of firms, including sole proprietorships, partnerships, and S corporations, are subject to this tax. New York City imposes an added resident income tax of up to 3.9 percent, which brings the total rate in the city to 12.7 percent, second highest in the country. The city also imposes an unincorporated business tax of 4 percent, which hits both resident and non-resident participants in pass-through entities. Third, the extension of the millionaire tax has also compounded New York’s reliance on what the Assembly Majority Ways & Means staff has called an “inherently unstable,” “volatile” and “unsustainable” revenue source. 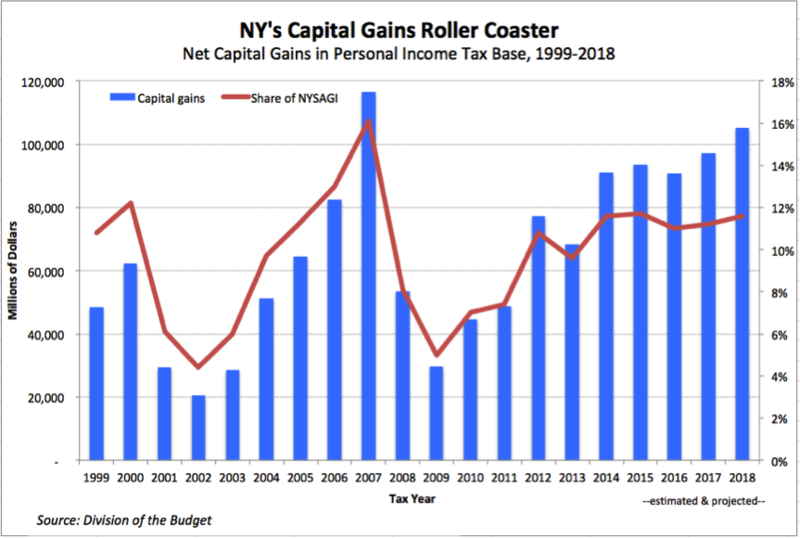 New York is more dependent than ever on revenues from its personal income tax, which generated nearly two-thirds of total tax revenues in fiscal 2017. The share of taxes generated by the highest-earning 1 percent has jumped significantly over the past 20 years, even without counting the millionaire tax, as shown in Figure 3. That’s because repeated cuts in taxes for low- and middle-income earners, especially the historic Tax Reduction Act of 1995, shifted more of the burden higher up the income scale. Comparing effective tax rates for high, middle- and low-income households, New York’s PIT code has long been among the most progressive of any state’s, by any measure. This was the case before enactment of the millionaire tax, and it will still be the case if the surtax is allowed to expire. The state’s last fiscal crisis, during the Great Recession of 2007-09, occurred largely because the incomes of the highest-earning 1 percent had dropped more than 40 percent. This, in turn, could be traced largely to a 75 percent decrease in net capital gains during this same period. This was the second such plunge in the space of a few years; between 2000 and 2002, net capital gains dropped by 66 percent, as depicted in Figure 4. Fourth, there is also the question of how the millionaire tax is affecting the tax base at the top of the income distribution. While it is impossible to establish any clear causal link, the repeated imposition of the millionaire tax—starting with a lower temporary surtax between 2003 and 2005, and starting again with the imposition of the current tax in 2009—has coincided with marked growth in portion of high-income taxpayers who are classified as Full-Year Nonresident. See Figure 5 in the Appendix. Nonresidents are taxed only on their New York source income, mainly salaries and profit shares from New York businesses, and not on their capital gains, dividends and interest that make up the bulk of their personal income. Many of our middle-class nonresident taxpayers are mainly commuters to jobs in New York City from New Jersey and Connecticut. In the $100,000-and-under category, they make up less than 10 percent of all taxpayers. Their New York source income is high, reflecting their reliance on salaries earned in the city. However, the percentage of nonresidents in New York’s PIT base increases sharply—and the allocation percentage for New York source income drops—as incomes rise. 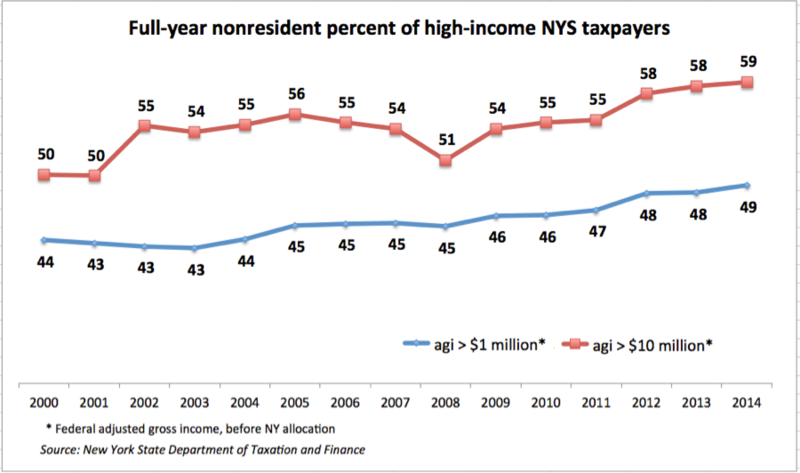 Nonresidents now make up nearly half of all New York taxpayers with incomes above $1 million, and nearly 60 percent of filers with incomes above $10 million, according to state tax data, as shown in Figure 5. Both these figures are the highest on record. Between 2009 and 2014, the number of resident filers earning $1 million or more increased 60 percent, but the number of nonresidents—who minimize their exposure to the tax—increased by 79 percent. Measured in terms of total AGI, the difference was even greater. Income growth over the five-year period was 76 percent in the resident category, and 124 percent (prior to allocation) for non-residents. Many if not most of the taxpayers in the most rarified high-income brackets are members of what might be called “the 183 Club”—people who carefully arrange their affairs to establish a residency in another state, and who monitor their presence in New York to ensure they are not here for more than 183 days a year. Indeed, an entire cottage industry of lawyers, accountants and software developers exists to help high-income nonresidents minimize their New York tax exposure. While nonresidents make up roughly half of the 45,000 households the governor estimates are subject to the millionaire tax, they do not generate a similar proportion of the nearly $4 billion that is raised from the tax. Their actual share ranges between 10 and 15 percent, depending on income class—because, on average, that’s the percentage of income they can allocate to New York sources. Even small shifts of millionaire earners can have outsized effects on New York revenues. For example, at an average 2014 federal AGI level of $5.4 million, if just 10 percent of New York’s 43,343 nonresident taxpayers shifted their main residence to the Empire State, Albany would gain $1.6 billion in revenue with a tax rate of 6.85 percent. For state government, downstate New York’s concentration of wealthy Wall Street investors, elite professionals, and corporate executives is like the goose that laid the golden eggs in Aesop’s Fable.
.@ejmej explained why NYS should allow income tax surcharges and film production subsidies to expire.